Definition at line 28 of file util-mpm-ac.h. Definition at line 29 of file util-mpm-ac.h. Definition at line 1239 of file util-mpm-ac.c. 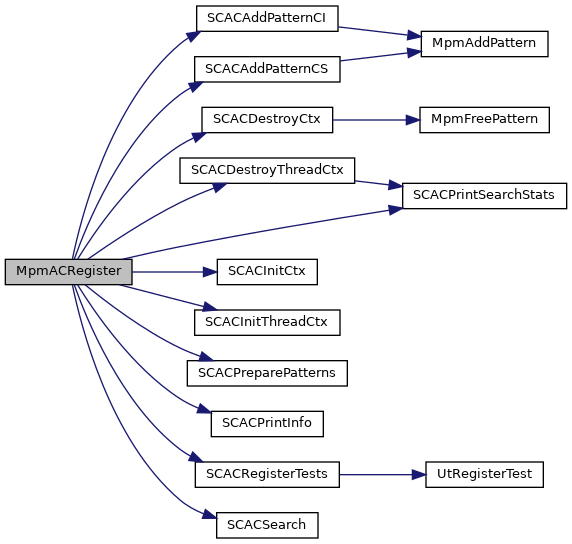 References MpmTableElmt_::AddPattern, MpmTableElmt_::AddPatternNocase, DE_QUIET, MpmTableElmt_::DestroyCtx, MpmTableElmt_::DestroyThreadCtx, DetectEngineCtxFree(), DetectEngineCtxInit(), DetectEngineThreadCtxDeinit(), DetectEngineThreadCtxInit(), DetectEngineCtx_::flags, MpmTableElmt_::InitCtx, MpmTableElmt_::InitThreadCtx, MPM_AC, mpm_table, MpmAddPatternCI(), MpmAddPatternCS(), MpmInitCtx(), MpmTableElmt_::name, Signature_::next, PacketAlertCheck(), PmqFree(), PmqSetup(), MpmTableElmt_::Prepare, MpmTableElmt_::PrintCtx, MpmTableElmt_::PrintThreadCtx, MpmTableElmt_::RegisterUnittests, SCACAddPatternCI(), SCACAddPatternCS(), SCACDestroyCtx(), SCACDestroyThreadCtx(), SCACInitCtx(), SCACInitThreadCtx(), SCACPreparePatterns(), SCACPrintInfo(), SCACPrintSearchStats(), SCACRegisterTests(), SCACSearch(), MpmTableElmt_::Search, DetectEngineCtx_::sig_list, SigCleanSignatures(), SigGroupBuild(), SigGroupCleanup(), SigInit(), SigMatchSignatures(), UTHBuildPacket(), and UTHFreePackets().